Yoshio Nishina (1890-1951) was a leader of the Japanese atomic bomb program, and the "father of nuclear physics in Japan." Nishina was born in 1890 in a village near Okayama, Japan. After high school in Okayama, he enrolled in Tokyo Imperial University, graduating with a degree in Electrical Engineering in 1919. He turned down an engineering job offer and enrolled in graduate school, first studying electrochemistry but soon switching to physics. He thought physics had more "unsolved puzzles" than engineering. In addition to his graduate studies, he became a research assistant at the Institute of Physical and Chemical Research (known by its Japanese acronym, RIKEN). In 1921, RIKEN sent Nishina to study in Europe. He studied at the Cavendish Laboratory at Cambridge, where he studied under Ernest Rutherford. In 1923, he moved to Copenhagen to work with Niels Bohr. He also visited Gottingen and Hamburg. Before he left Copenhagen in 1928, he published a paper on Compton scattering, a collaboration with Oscar Klein. 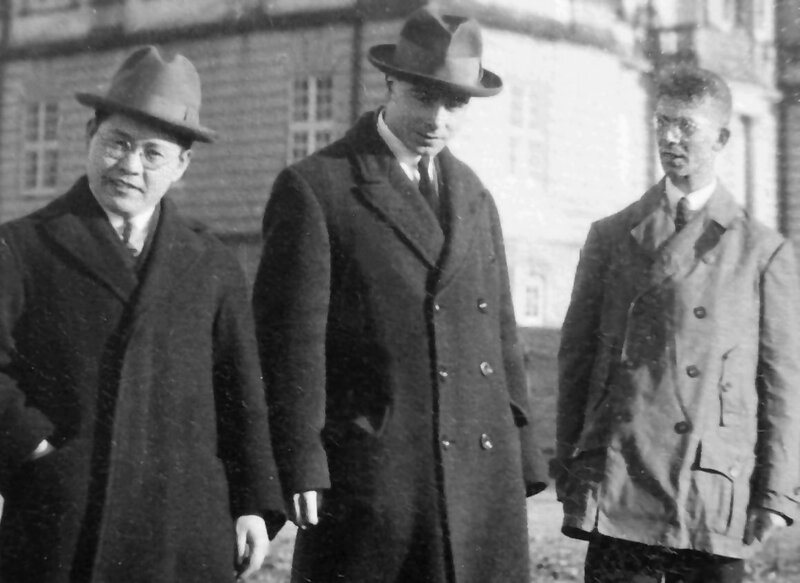 After he returned home, he convinced Werner Heisenberg to visit Japan and give a number of lectures. Later, in 1937, Bohr and his wife also visited Nishina in Tokyo. In 1931, Nishina established his own lab. Its focuses became quantum mechanics, nuclear physics, cosmic rays, and high-energy proton beams. Nishina completed a "small" cyclotron in 1937, the first cyclotron constructed outside the United States (and the second in the world). While he was constructing a larger cyclotron, he consulted Ernest Lawrence for help. Lawrence assisted him in buying an electromagnet from an American company, and hosted some of Nishina's assistants in 1940. Communication between the two physicists was cut off by the start of the war. The "large" cyclotron would not be complete until 1944. In 1940, Nishina was asked by Lieutenant General Takeo Yasuda to research nuclear fission. In April 1941, the The Imperial Japanese Army (IJA) officially authorized Ni-Go, the project to research an atomic bomb. Nishina’s team’s initial conclusion was that an atomic bomb was theoretically, but not technically, feasible, but they continued to pursue uranium enrichment via gaseous thermal diffusion (a process that had been abandoned by the Allies in 1941). Some historians have asserted that Nishina may have used the military’s focus on weaponry to get funding for the cyclotrons, his pet project. Nishina also participated in a committee convened by the Technical Research Institute of the IJN between 1942 and 1943. After several meetings, the committee disbanded with pessimistic conclusions. Meanwhile, Nishina continued his research for the IJA. In June 1945, a few months after RIKEN facilities were bombed, Nishina declared the project over, and resources were handed over to the Imperial Japanese Navy's (IJN) F-Go project. The day after the US dropped an atomic bomb on Hiroshima, Nishina received a copy of a restricted press release about the bomb that had come from President Truman. Nishina confirmed to the government the veracity of the claims about atomic weaponry. This may have influenced the decision-making process that eventually led to Japan's surrender. In October 1945, after surrender, Nishina asked the occupying forces for permission to continue using his remaining cyclotrons for biological and medical reserach. Permission was initally granted, then rescinded under orders from the Secretary of War. Every cyclotron in Japan was destroyed. The ones from RIKEN were disassembled and thrown into the Gulf of Tokyo. After the war, Nishina became president of RIKEN and helped salvage the institute from the ashes of war. He passed away in 1951. RIKEN later named its Center for Accelerator-Based Science after him, and the Nishina Memorial Foundation gives out awards in his name on an annual basis. 1890 Dec 6th Born in a village near Okayama, Japan. 1919 Graduated from Tokyo Imperial University. 1921 to 1928 Studied in Europe.